Roger…..Roger… – Dirty wet dog , boats and sailing. Note to regular readers : this post and the recent re-write of ‘how small…ocean’ now replace the original post of that name. The original post featured arctic sailor Roger Taylor and his 2 arctic exploration boats but i don’t think i did that job very well so in this re-write i am just going to focus on him, his boats and his voyages. When i wrote the original piece i contacted Roger to see if he could be available to talk with directly : at the time i was thinking about trying to make that my first blog interview and i’m somewhat glad that it didn’t work out because i wasn’t set up for it then. As it worked out Roger had too much going on to meet up with me but was happy for me to use any material that was already in the public domain so in this post i am only using already available photographs, mainly Roger’s own and links to his own website. As a side note here i would like to say that i much prefer to take my own photographs and do original work, when i write i try to do so based on personal observation and experience but sometimes have to use another photographers pictures. That has mainly been the case when i have highlighted boats for sale and they are usually the brokers pictures an i try to make sure that i point that out. Thus far no one has contacted me to complain and in return i am very happy when others use my photographs. There is a problem on the horizon though with proposed EU internet regulation that among other things seeks to prohibit the further use of copyrighted material…..music used by many youtubers for example : http://www.theweek.co.uk/94464/article-13-are-we-heading-for-mass-internet-censorship I followed article 13 quite closely and have to say that it was an appalling display of clause after clause being added and approved by a fundamentally non-democratic body that just seems to want to gain control over the internet. I jest but maybe one day describing motor boaters “MOBO’s’ and owners of Westerly Centaur’s as oxygen-wasting window-lickers might have me done as a hate-speech propagating shitposter !…….as i say i jest but the internet is becoming weirder by the day. Meanwhile in the real world there is a bloke in a boat that he built himself cruising way up in the arctic ocean……time to meet Roger. This is a Yachting Monthly video clip taken at the time when Roger Taylor was just finishing and doing sea trials with Mingming 2…his converted Achilles 24. That might seem a strange place to start, a bit like walking into a film just as the car chase is getting under way but it’s the beginning of what he is doing right now with is current boat : as i understand it he isn’t long back from this years cruise a long way north and east….even beyond Yorkshire !. So, lets pull things back a bit, get a bit more organised with the writing and break this down into a few sections….lets start with the 2 arctic exploration boats that he has built/converted from unlikely small cruising yachts. Mingming 1 was Roger’s first arctic exploration boat but not as i understand it his first personal boat, that i believe was a more conventional bermudan rigged sloop which he built himself in a shed in New Zealand . That boat, ‘Roc’ was ferrocement and intended as a small offshore cruiser/racer. In 1974 he sailed that boat in the trans Tasman race during which the boat was rolled and suffered severe damage to it’s rig and self-steering gear. Mingming 1, originally a 19 foot Corribee design called Phaedra Roger converted into a junk rigged and ultra-simple ocean going boat and sailed it first in the 2006 Jester challenge….essentially a small boat transatlantic event although not quite an ocean race and more akin to the early days of the singlehanded transatlantic race. I have spent a fair amount of time reading Roger Taylor’s work, watching the various refit/rebuild video’s and endlessly studying the photographs for ideas for my own small boats. The main practical points with this boat seem to be : conversion to junk rig, reduced cockpit volume, sail handling from the companionway, wind vane self steering and steer-able from the same position, jordan series drogue, simplified interior (and insulated) just for one person, reserve steering oar/sweep. Mingming 2 is the boat that Roger is aboard in the first video clip and at that point just coming up to sea trials. Luckily for us Roger filmed an entire series of video clips during the 2 year rebuild process…..everything from the new cockpit and watch position, the interior, the rig and his own design of cambered junk sail. The original boat was the triple keel version of the Achilles 24 and that’s a boat i have covered several times in the starter boat/budget boat series. What Roger says about the larger an longer Achilles is that he didn’t want or need the additional space rather he wanted the longer waterline to give him a higher average speed and a bigger rig to push him along in light weather arctic sailing. The longer waterline is something i have often talked about because there have been times when i haven’t so much wanted a bigger boat as a longer one and as members will know was seriously kicking around the idea of using the same hull for my own project. Mingming 2 with the much more powerful rig. And finishing with the almost complete boat here. While it was clearly a long project and a radical rebuild of a very basic boat this is all the kind of work i could contemplate myself except the canvas work and sailmaking. I think that something it shows very well is that it’s possible to get much nearer to the boat we need starting with something of very low cost but with some degree of investment and a lot of steady work. Later on in this post i will talk about why and how Roger Taylor’s boats, his ideas and his sailing affect and influence my own but for now just to say that i still kick around the idea of starting with an Achilles 24 and modifying it although not along Mingming 2 lines. Anyway and for now lets move smartly along to what Roger does with his boats. What Roger is best known for are his yearly arctic voyages of up to 7 weeks per voyage and all done solo : not only that but as far as i am able to tell Roger never lands on any of the Islands that he visits but just films them and sails on. I have only been in arctic waters once and during that trip we anchored in a bay off Jan Mayen Island and some of the crew were able to go ashore, sadly i don’t have any photographs from that trip although i do remember sitting in the cockpit and reading in sunlight at 03.00 ! It’s not somewhere i would chose as a sailing ground : stark, severe and often bleak from what i saw and from watching Roger’s films of the voyages. I don’t think i would want to spend that amount of time alone in a such a small space even though and maybe because of the fact that my longest single passage was also 7 weeks although that had even less to offer for scenery after passing the Horn ! But, it’s his life and his voyages and he clearly gets great satisfaction from what he does. I will link to just one video…Mingming 2 setting off for this years voyage to the Barents sea. Roger has written at least 4 books that i know of , publishes articles in the blog section of his own website and has produced many video clips from his boat refits and his arctic voyaging : there’s a lot in his work to talk about. I have only read 2 of the books at this stage starting with ‘Voyages of a simple sailor’ , right now i can’t find my copy which might be aboard my boat but luckily there is a copy kicking around in the honesty cafe down at the yard so i serial re-read that during my visits to the yard and cafe during my recovery period. Similar to the Pardey’s who have hugely influenced my own small boat sailing Roger Taylor espouses small and simple boats, almost the smaller and simpler the better and that is a natural point i have come to myself because of having to work with a very small budget. There is a great attitude of ‘can do’ in Rogers work : i can almost sense a ‘kiwi’ attitude there !. Today i want to finish with something that Roger talks about and that i have been working my way towards in my own writing and that is the point of ‘need’ vs ‘want’ or ‘would like’. I think there is a huge trend and pressure from the yachting press and the yachting industry to suggest that we ‘need’ this or that…..just go and look at equipment reviews for example and just look at the level of equipment on many of today’s boats and even the size and complexity of those boats. 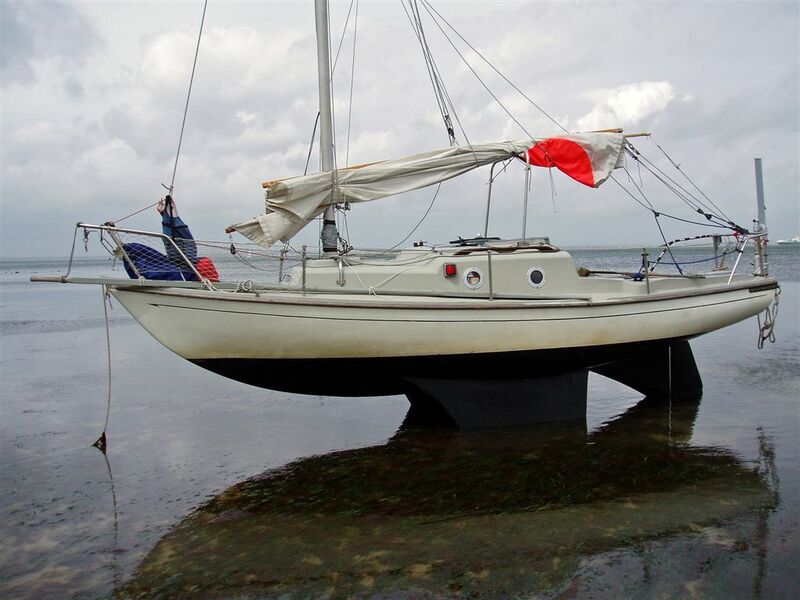 In an earlier post in this series i told a simple sea story of me and my own ‘simple’ boat, it’s minimal set up and a ‘simple’ voyage but that i also made a slightly scathing comment or 2 about a non-voyage in an over equipped (to my eye) modern cruising boat. I have an analogy here that we used in another outdoor discipline that we used in our teaching of equipment selection and exactly that of what we need rather than what we would like to have. In other forms of outdoor practice many hikers/bushcrafters also over-equip and then pay the price literally and in terms of weight for carrying kit that they don’t really need . It’s the same with kit on boats, it might be nice and shiny and give us a sense of security but a lot of it isn’t absolutely necasary. There is also an opposite side and that is when vital equipment is skimped on : poor anchor set-ups are one bugbear of mine. Today Roger’s major influence on me is to make me question what i need rather than what i want or would like to have. I would like to have, for example, a bigger boat with more space and ‘longer legs’ but i don’t strictly ‘need’ that to do the voyages that i do. To sail and go cruising i clearly need a boat and that boat for me needs to have a certain sailing capability, it needs a dry cabin where i can sleep and i need to navigate and cook and carry a certain amount of gear, water and stores. Roger shows how that can be done and has been done with a smaller boat than my own and for much longer and harder voyages. Where Roger and i concur is that a bit more waterline than he had with the Corribee (and i have with the liberty) would give him greater range and in my case might get me into an anchorage before hitting a tidal gate. Previous How small….downsize and solo. Next Going small : sailing large.